What Can Instagram Tell Us About Social Upheaval in Ukraine? A closeup of Instagram photos taken the morning of February 19, after government forces attacked the Maidan the previous night. Photo courtesy of "The Everyday Project." Twitter and Facebook have become default resources for journalists, newsrooms and ordinary citizens during news events, but where does Instagram fit into that picture? That was the question a team of researchers at CUNY’s Graduate Center asked while watching the protests in Ukraine unfold this past February. After months of analyzing more than 13,000 Instagram photos shared by around 6,000 people in the central square of Ukraine — known as the Maidan — the team has recently released the study “The Exceptional & the Everyday: 144 Hours in Ukraine.” It’s the first project to analyze the use of Instagram during a social upheaval. Instagram is known as the visual social network, but according to Lev Manovich, a computer scientist and the lead researcher for the project, it’s much more of a “communication medium.” Whereas newsrooms might scour Instagram for photos to showcase breaking news, the study found that ordinary Instagram users detail how they’re relating to news as well — which may be just as important. A visualization of images using at least one of the different spellings of Maidan organized by date and upload time. 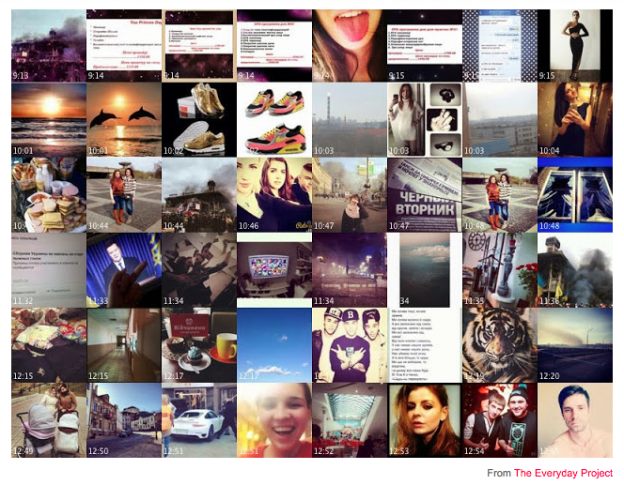 Accounts documenting the everyday experience around the world are already popular on Instagram. The purpose behind them is to offer users a snapshot of life in a different country, or a look at systemic, underreported issues mainstream media might miss. But by analyzing the different visualizations they created from filtering the images, the researchers at CUNY were able to see how both the “everyday” and the “exceptional” were taking place simultaneously, and how they were affecting the community. Images that weren’t necessarily documenting the protests at the central square still might have had key Euromaidan hashtags associated with them, for instance, which shows how the Instagram user is perceiving the revolution, said Alise Tifentale, one of the researchers of the team who also has a background in art history and photography. Manovich calls this kind of documentation a “slippage” between the everyday and the exceptional. It occurs because of how Instagram users are already interacting with the platform. Thus, images of selfies and random locations, filtered to set a mood over the picture, stand against the influx of war and crisis imagery. With every “hill,” corresponding to a 24-hour period, the red areas show the number of images shared around the central square — around 14 percent of all images. For the study, Manovich and his team focused on finding larger trends and patterns from the different images. Visualizing the images by date and time, for example, showed the movement from night to day. Graphing the data showed peaks in Instagram activity that coincided with events that took place in the public square. 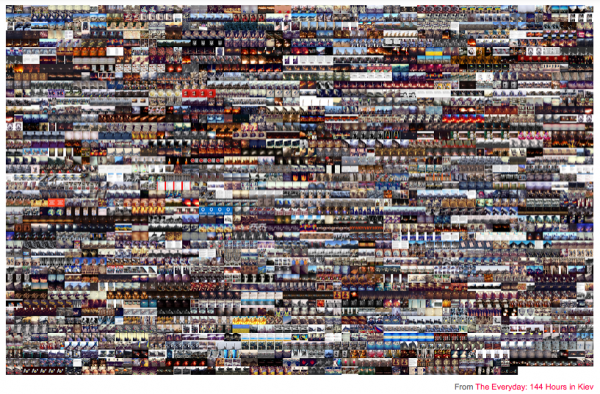 But viewing the images in this way was also counterintuitive to how most people use Instagram. “The problem is that you’re no longer seeing the images,” Manovich said. Looking at the images alone creates a “fragmented narrative” of what’s happening, according to the researchers. “Among other things, we wanted to see how we can ‘read’ a story told by an accumulation of images that all subjectively represent their makers’ unique perspectives and insights,” Tifentale wrote. Yet “reading a story” from patterns is typically not the focal point for individual journalists on the ground and editors and producers in newsrooms — at least, not yet. “The power of Instagram in my mind is that it reaches people with visual media at a moment when they are specifically seeking that out and are most receptive to it,” Brendan Hoffman, a photographer based in Russia and Ukraine, wrote in an email interview. Hoffman wrote about his experience Instagramming the Maidan protests for Newsweek. Other media outlets, including TIME, Esquire and the New York Times, also featured Instagram coverage in its documentation of Ukraine’s protests. Jonathan Woods, a senior multimedia editor at TIME, agreed the power of the image is Instagram’s edge over other social media networks. “The thing that’s universally understandable about Instagram is that you’re speaking visually,” he told PBS MediaShift. Woods said that the platform has become a useful tool for TIME, and that the team there is always searching for stories on it, especially during breaking news. In other words, they’re searching for the exceptional against the everyday. But for the researchers of the Kiev study, noticing the ordinary in the middle of the exceptional during the breaking news event is how they’ve been able to understand how people were actually feeling. Sonia Paul is a freelance journalist based in India. She’s on Twitter and Instagram @sonipaul.